Happy New Year! I promised you something fun on Wednesdays….this week – it’s a gift I received from a student! (Thank you Nichole!!) 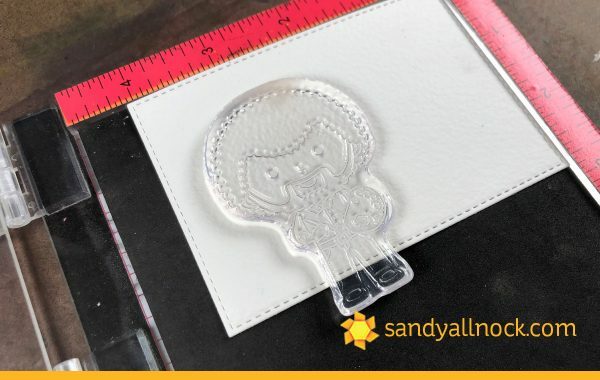 She sent me a cute little stamp set from Kindred Stamps – Happy Trees! Note: Supplies are linked in the supply list at the end of this post. Compensated affiliate links may be used – that means if you make a purchase using my links, I receive a small commission at no extra cost to you. Thank you for your support of my work on this blog! Read more. I made a card and took a few pics along the way….I made my own tv set (or computer monitor!) for Bob to appear on! 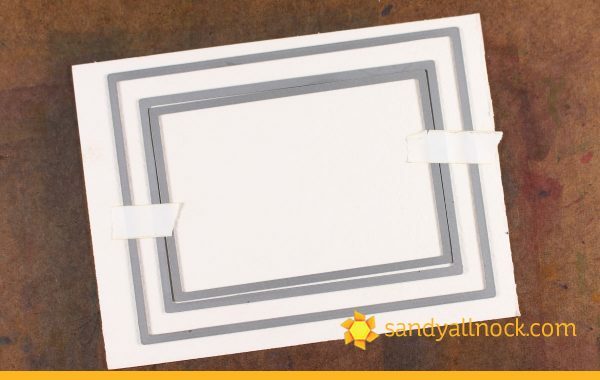 I started by diecutting the frames needed from a piece of Arches Cold Press, using MFT stitched dies. My tv ended up with stitches, but I’m ok with that. In the “screen” rectangle I set up ol’ Bob in my MISTI and stamped him in Versafine ink. I drew in my own easel and canvas…. And started painting! Bob’s face is a mix of Yellow Ochre with Burnt Umber. I painted right through his hair since it would be painted over with darker colors anyway. Bob’s hair is a mix of Burnt Umber with Neutral Tint. 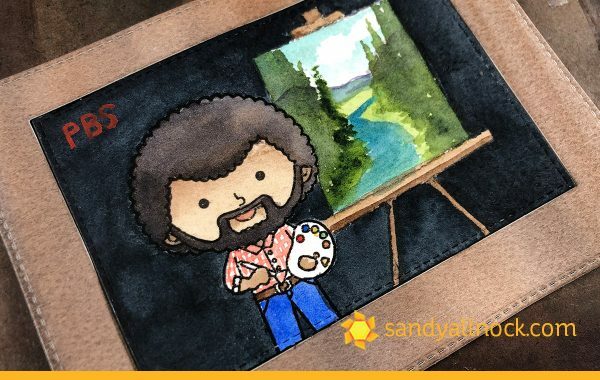 I looked at some of his videos and they often had a simple dark background – I opted for Paynes Blue Grey and then added happy trees to the canvas. I nested the finished painting (with a cute plaid shirt!) into a window the same size that I diecut into a “wood” panel that’s just been painted browns. I colored the tv frame with Copic black marker – just so it’d be good and black. The back of the tv got some Be Creative tape, and a piece of acetate. Then more tape so I could add it onto the card. I built a “stand” out of watercolor scraps cut down with scissors and colored with Copic black as well. Sentiment was stamped onto a scrap of painted watercolor paper, then popped onto the card. 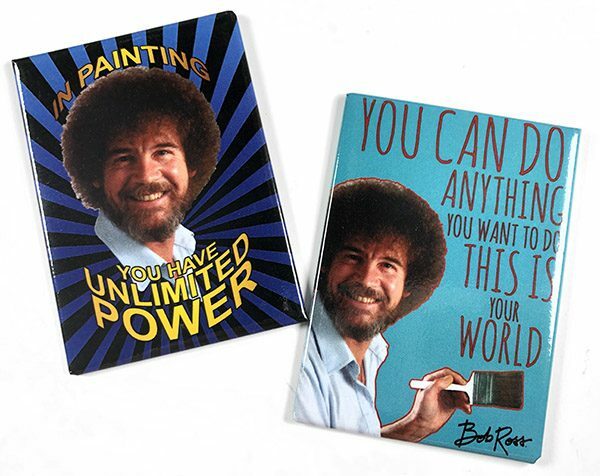 Nichole also sent some cute magnets….got to LOVE Bob Ross, right? ….you need something to make you smile, did you know Bob Ross has a YouTube channel where they’ve been uploading his shows? 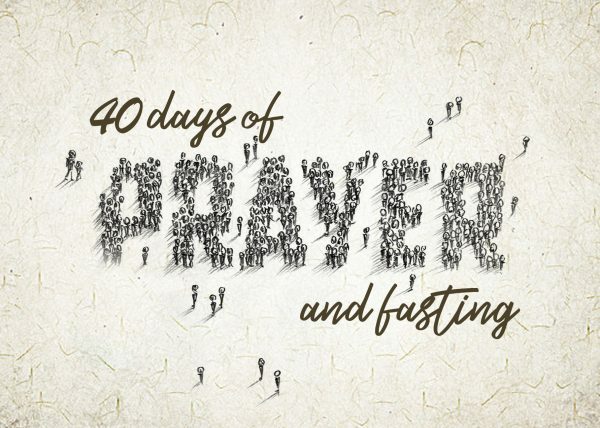 It’s not a traditional course – it’s 40 days of prayer prompts, verses, worship videos, and a sketchbook sketch (not outlines) to encourage prayer, fasting, and art (though Bible journaling is not required). Whatever day you sign up is your “day one” and each consecutive day is then made available to you after that. Sign up here. Sandy great fun card but I must be the only person that has no clue who this man is. I’m sorry. Maybe it’s because he’s not that well known in the UK. But fun videos thank you. This is awesome. I recall that when I first discovered you several years back, I commented that your work reminded me of Bob Ross. That has not changed. I watch you color and you just bring things to life the same way that he did. Bob… my favorite!! Great job Sandy! I always loved watching him on TV. I was amazed that with a few brushstrokes he had happy trees. Great card. 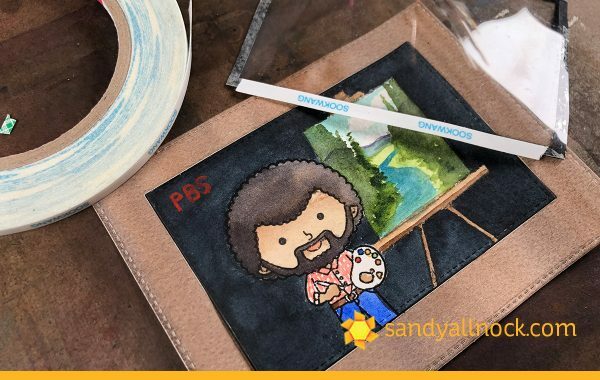 Awesome Sandy, I remember the tv shows with Bob Ross and a girl i knew was so fond of him that se even followed a live class with him. Thank you so much for your lovely post. Awesome!!! I have this set, but I haven’t had a chance to play with it yet. What a great idea to build a tv sceen for it!!! 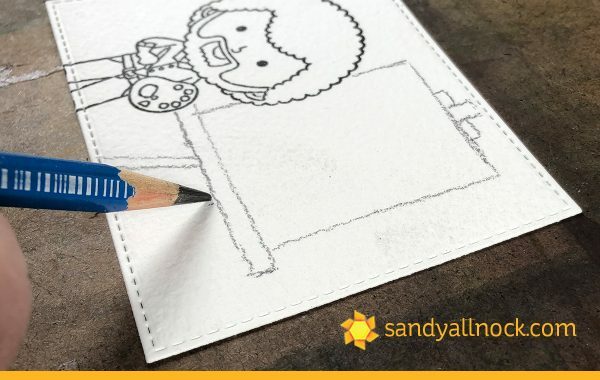 This is so fabulous Sandy! I have this stamp set and I haven’t had a chance to play with it yet. What an awesome idea to build a TV screen for it!!! What timing! I had not seen a Bob Ross video for a number of years and just the other day my husband had it on TV (PBS? )and I watched him in awe! Plus I’m pretty sure he used the sentiment on your card during the video! 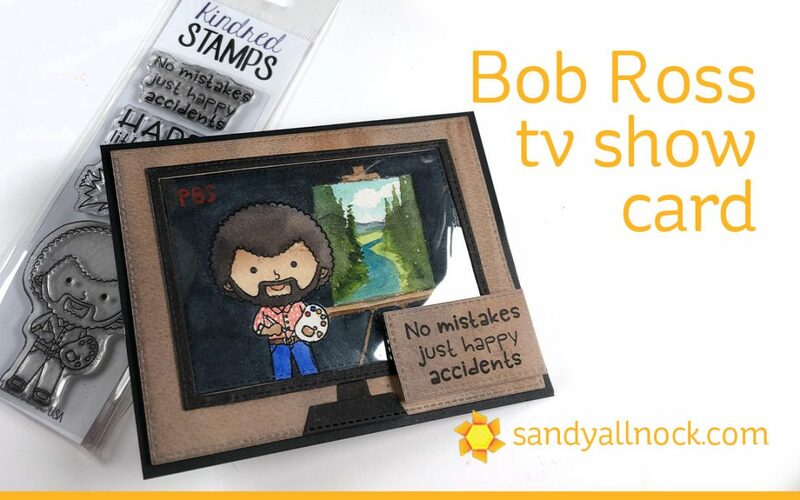 Your card is a delight and I love your creative way to make a TV set on which to “watch” Bob! I love Bob Ross! He is so soothing to listen to! 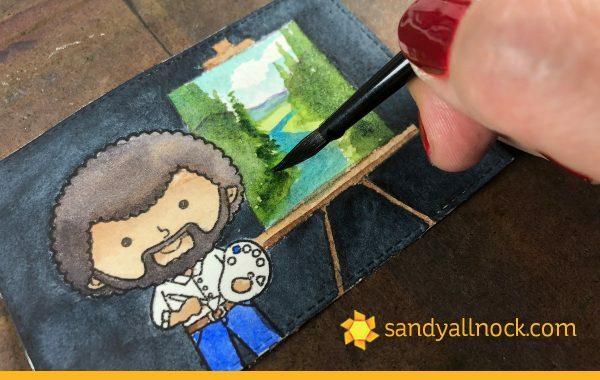 I am such a Bob Ross fan and this card makes my heart happy! I’m so glad I found your channel. 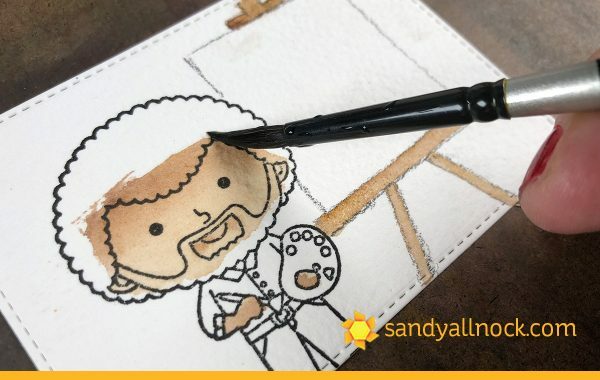 Now I’m as big a Sandy Alknock fan as I am a Bob Ross fan! Isn’t it amazing that a military person could become this magical painter that shared his gift with the world? Love your card, so very original. thanks as always for sharing. 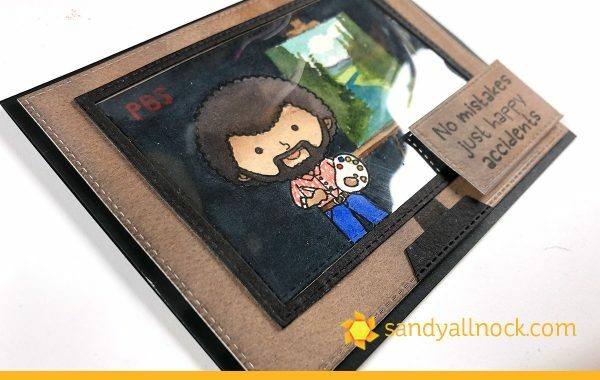 I am such a fan of Bob Ross and this card made my heart happy! I’m so glad I found your channel so I could become a fan of you as well! O.M.G. What a happy little card! It makes me smile! I love how you sketched in your easel and made a TV. I’m so glad Bob’s re-runs are still On Demand to watch anytime I want – never get tired of them. Love this! Your card made me smile, and then I laughed out loud! Bob would have smiled too! Now to go watch the video on YouTube. Oh my gosh! Your card made me smile, and then I laughed out loud! Bob would love this! Now I have to go watch the video on YouTube. This is a hoot! Love this! Your card made me smile and then laugh out loud. Bob would love it! Your card is so so cute! Love Bob Ross, especially when I can’t sleep. LOL! Fabulous job using that stamp set which by the way I also own. But your use of it by far surpasses mine. I always loved to watch his shows and do now and then check out his You Tube channel too. Your painting is so well done too. Thanks for sharing and I will have to get my Bob Ross out soon and work with him again too. This is awesome Sandy. I have you right up there with Bob Ross! You are amazingly talented! I thoroughly enjoyed see this Bob Ross episode Sandy. My husband and I used to watch him every week on PBS. Its funny that I am just remembering how after our 2 children were born, they watched it every week with us and since our daughter was 3 or 4 said she wanted to be an artist and go to art school when she grew up! AND so she did! 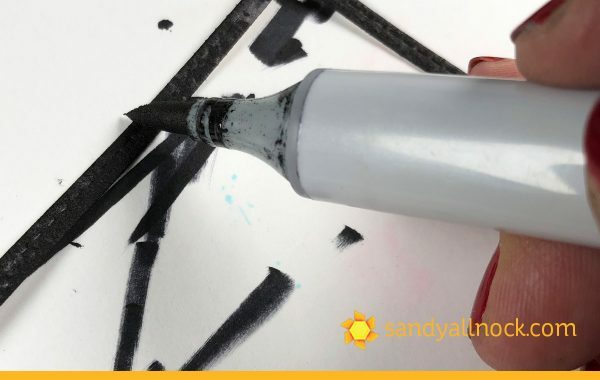 She can paint and draw ANYTHING and has become a jewellery designer, however, her heart lies in painting and drawing, which she is getting back too. (I have been encouraging her for YEARS to write and illustrate children’s books. NOW, I think she should also be designing stamps!) After seeing this, I am thinking THIS may have had a lot to do with it! People need to expose their creative children to what it is they enjoy! His voice is so calming and he seems so relaxed doing it. Too many times I get unrelaxed and forget to just paint/relax. He would be happy to see that we are still ‘happy’ to be watching him. Thanks for the link and your great card. I bought that stamp the second I saw it a few months ago and then wondered what in the world would I do with it. Your card is a great idea. 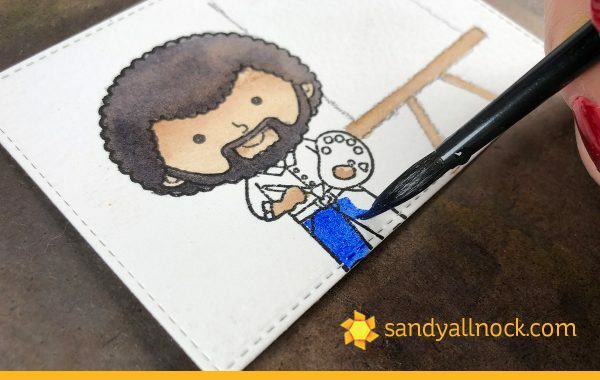 This is so great … I want to make a Bob Ross card for my nephews birthday, where did you get the stamp? Link is up there at the top of the post.